Plot: Without giving anything away, the film is about a poet, Charles Bukowski, who lives a life of alcoholic endeavors and writes every night. The main character, Henry Chinkaski, is a pen name Bukowski had used for years. Henry meets Wanda, in a bar naturally, and they form a codependent relationship based on their mutual love of booze. Neither one is made for the everyday regular world, and neither one really wants to belong in the rat race. When Chinaski is "discovered," he comes into some money but still remains the same person he had always been. Along the way the viewer gets a look into the world of day-drinkers, and we meet Chinaski's polar opposite in the form of Frank Stallone. Why you should watch it: I've long been a fan of Bukowski. However, he is an acquired taste. To the uninformed, he's a rambling misogynistic alcoholic. However, when you read both his books of poetry and his novels, you understand exactly what kind of person he is. He's a 1%er, much like a member of an outlaw motorcycle club. He is one of the 1% who doesn't go along with what society determines is "normal life." If you've never read Bukowski, I recommend his poetry (Love is a Dog from Hell, War all the Time, You Get So Alone At Times That It Just Makes Sense) and his novels (Post Office, Factotum, Women). Mind you, these are just a small sampling of his work, but they're the ones I rank as his best. 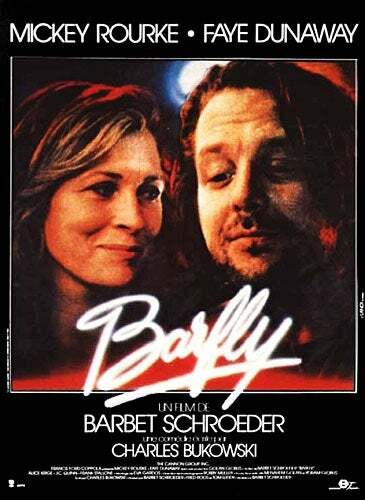 Barfly is a wonderfully low-key movie; more a study of characters than a true linear storyline. Mickey Rourke plays his role quite well, depicting most of Bukowski's mannerisms and speech patterns. This is more an homage to Bukowski than a true impression. Faye Dunaway is sadly wonderful as Wanda. I feel this is her best role after Mommy Dearest. I'm not even kidding here - Frank Stallone is really quite good in this. I know... it's Frank Stallone, but he plays the role of a meatheaded mook quite convincingly. The rest of the cast is a hodgepodge of faces who blend in beautifully in the dimly lit safety of a mid-day bar.